Athoracophoridae, common name the leaf-veined slugs, are a family of air-breathing land slugs, terrestrial pulmonate gastropod mollusks in the infraorder Stylommatophora, the stalk-eyed snails and slugs. Many of the species have an attractive pattern on their dorsal surface which resembles the veins in a leaf, hence the common name. Athoracophoridae is the only family in the superfamily Athoracophoroidea. 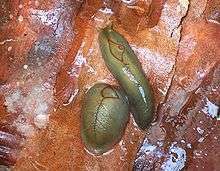 Leaf-veined slugs live on the various land masses and islands in the south-west Pacific area. The scientific name Athoracophoridae is derived from prefix "a-", that means "without" and from a Greek word "θωραχοφὁρος" (thorachoforos), that means "breastplate". This is a reference to the fact that the mantle in these slugs is small and not well delineated; it does not have the obvious, saddle-shaped or breast-plate-shaped appearance that it does in most other land slug groups. In the family Athoracophoridae (in subfamily Aneitinae and in subfamily Athoracophorinae), the number of haploid chromosomes lies between 36 and 45 (according to the values in this table). While they belong to the pulmonate snails, they lack a true lung. The vascularized mantle cavity is reduced, and a series of blind tubules radiate from it, being surrounded blood vessels. This allows for a more compact lung structure in these generally flat animals. Species in this family are found in eastern Australia, New Zealand including its sub-Antarctic islands, Bismarck Archipelago, the Admiralty Islands, the New Hebrides, New Caledonia, as well as on the Melanesian islands north to New Caledonia and New Britain, Papua New Guinea. The name Athoracophoridae has precedence over the name Aneitidae, because Athoracophoridae is in prevailing usage. 1 2 3 (French) Fischer P. (21 February 1883). Manuel de conchlyliologie et de paléontologie conchlyliologique (5): 417-512. Savy, Paris. page 492. 1 2 3 Bouchet P.; Rocroi J.-P.; Frýda J.; Hausdorf B.; Ponder W.; Valdés Á. & Warén A. (2005). "Classification and nomenclator of gastropod families". Malacologia: International Journal of Malacology. Hackenheim, Germany: ConchBooks. 47 (1-2): 1–397. ISBN 3-925919-72-4. ISSN 0076-2997. ↑ Burton, W.D. (1982). "How to be sluggish". Tuatara. 25 (2): 48–63. Retrieved 8 May 2014. 1 2 3 Burton D. W. (1982). "How to be sluggish." Tuatara 25(2): 48-63. page 55. ↑ (German) Grimpe G. & Hoffmann (1925). "Die Nacktschnecken von Neu-Caledonien, den Loyalty-Inseln und den Neuen-Hebriden." In: Sarasin F. & Roux J. (eds.) Nova Caledonia, A (Zoologie), Band 3, Heft 1-3: 337-476, plates 5-6. Burch J. B. (1968). "Tentacle retraction in Tracheopulmonata". Journal of the Malacological Society of Australia 1(11): 62-67. Burch J. B. & Patterson C. M. (1969). "Systematic position of the Athoracophoridae (Gastropoda : Euthyneura)". Malacologia 9: 259-260. Burton D. W. (1962). "New Zealand land slugs — Part 1". Tuatara 9(8): 87-97. Burton D. W. (1963). "New Zealand Land Slugs — Part 2". Tuatara 11(2): 90-96. Burton D. W. (1980). "Anatomical studies on Australian, New Zealand and sub-antarctic Athoracophoridae (Gastropoda : Pulmonata)". New Zealand Journal of Zoology 7: 173-198. Burton D. W. (1981). "Pallial systems in the Athoracophoridae (Gastropoda: Pulmonata)". New Zealand Journal of Zoology 8: 391-402. Forcart L. (1973). "Notes on Veronicellidae and Athoracophoridae in Field Museum of Natural History, Chicago". Nautilus 87: 25-27. Grimpe G. & Hoffmann H. (1924). "Diagnosen neuer Athoracophoriden (Gastropoda, Pulmonata)". Zoologischer Anzeiger 58: 171-177. Oberzeller E. (1970). "Ergebnisse der Österreichischen Neukaledonien-Expedition 1965. Terrestrische Gastropoda II: Veronicellidae und Athoracophoridae." Annalen des Naturhistorischen Museums in Wien 74: 325-341. PDF. Plate L. H. (1898). "Beitrage zur Anatomie und Systematik der Janelliden". Zoologische Jahrbucher. Abtheilung fur Anatomie und Ontogenie der Thiere (Jena) XI: 193-269. Suter H. (1897). "A revision of New Zealand Athoracophoridae". Journal of Molluscan Studies 2(6): 245-257. abstract. Stanisic J. (1998). "Family Athoracophoridae". pp. 1109-1110. In: Beesley P. L., Ross G. J. B. & Wells A. (eds). Mollusca: The Southern Synthesis. Fauna of Australia. Melbourne, CSIRO Publishing Vol. 5, Part B, pp. vi-viii, 565-1234. Wikimedia Commons has media related to Athoracophoridae. "Athoracophoridae". National Center for Biotechnology Information (NCBI).